Sometimes, certain events are taking us by surprise. May it be during our everyday life, at work, while talking to someone we haven't seen in a long time... or in sports! Clearly, we agree with many countries and/or influential individuals that competitively playing video games is sports. And last Saturday, 19 Masters played our video game competitively and some of them truly surprised us. 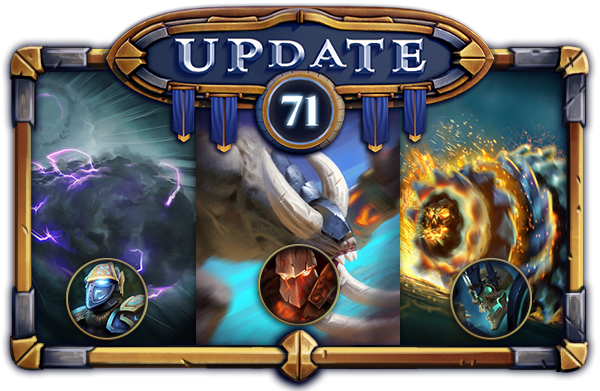 Update 71 introduced the long-awaited finals of the Tri-Team in-game event we had back in May this year. All of our 9 Masters were split across 3 houses and players were able to pledge their votes for their favorite house. House Valor was the glorious winner back then and last Wednesday, our 3 winning Masters were finally ready to fight it out against each other. Mordar, Stormbringer, and Volco chose their contestants and now they hope to fascinate the crowd enough to vote for them. It's all about 3 cards, known to many players already from Forced Showdown: the shocking Stormy, the charging Taurus & the Wheel of Doom. The Master with the most votes on Wednesday, July 25th will get his respective card implemented into Minion Masters at a later point. But how are these votings look like at the moment? Is your favorite Master or card currently leading? This will be shown in-game coming Wednesday, July 18th. Tuesday, July 24th at 18:00 UTC. 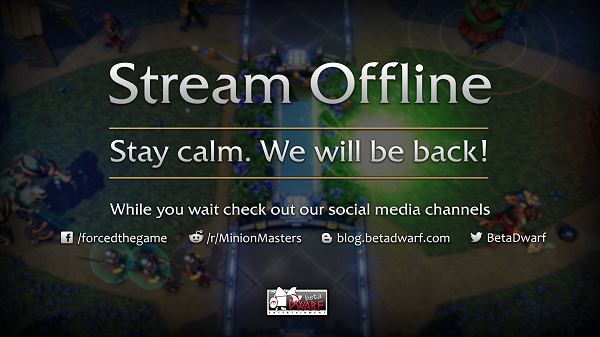 Yes, there will be no Dwarf stream tomorrow, unfortunately. This is partially a decision based on our latest survey regarding our weekly Dwarf streams. You, our audience, want another setting and a different focus content-wise. There are also some other improvements you want, like more top players on stream and/or Developers. We are listening! To get the streams where you want them and to have them making the impact we want, we will improve the setting and content of these streams. That process will take some time, though, and will happen mostly in the background until we are ready to present the new setting to you. That means our next undisclosed numbers of Dwarf streams will still use the old setting and content prioritization. Stay tuned for more information on these improvements over the course of the next weeks! By the way: We always had some internal news in our weekly Dwarf streams. This week, our Community Manager Erythais will be on vacation starting tomorrow, July 17th until next week's Tuesday, July 24th. His tasks will be handled by various team members or by helpful tools to automate several things like social media, the blog posts, etc. And took us by surprise. Not only that Videogamer77 didn't make it to the Top8. We also missed some other usual players in the final stage, such as ecke the Angry Snail, GReYWolF93, and Jamez28. On the other hand, we saw Nuclear Goo making it to the final stage again. We also saw names like boxes, Dirion & Acesir. Looking at how the final stage went, there were fewer surprises, but big ones. A little final for us was Memfisto versus RushSecond. Two KPI winners against each others & one of them deciding the match undefeated. In the end, RushSecond rushed to the 8th rank this time losing 0:3 to Memfisto. Another little final for us was katt versus Dirion, which ended in katt's favor with a 3:0 victory. In the semi-finals, katt met TerraReveene. And we saw yet another 3:0, this time not in katt's favor, though. In the second semi-finals, Memfisto lost to boxes - 3:0. The grand finals was between Terra Reveene and boxes. This time, we saw no 3:0. It was a 3:1 for boxes in the end and how that match went along with all the other matches from the group and final stage can be seen right here! Congratulations to boxes and all other winners & a big thanks to all participants, viewers, the amazing casters, and the whole King Puff Cup staff! That's all for today, Masters! Enjoy the Best of House Valor event and gather the keys for your favorite Master & we wish all of you a good start to the week.